Steinhauer’s bomb brings Handa Cup back to U.S.
WEST POINT, MS. – Given the Americans’ lack of success in the last three Ryder Cup matches and the last two Solheim Cups, Sunday’s U.S. victory in the ISPS Handa Cup represented a breath of fresh air. 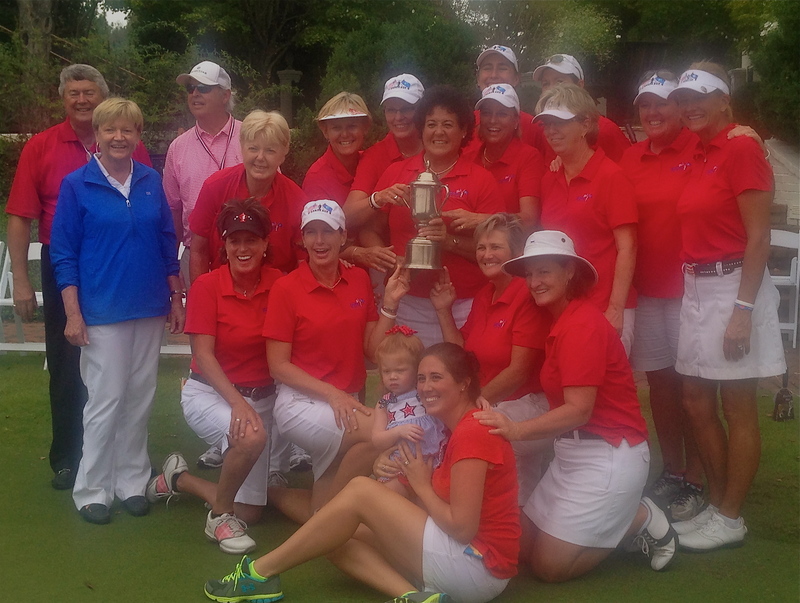 Captain Nancy Lopez and her U.S. team celebrate the regaining of the Handa Cup. The U.S. had struggled in the previous two Handa Cups, the premier team event put on by the LPGA Legends Tour. After six straight victories the World teams managed a tie with the U.S. in 2012 and its first victory in 2013. This year’s ninth staging was up for grabs after the teams battled to a 12-12 tie after Saturday’s best ball and alternate shot matches. In Sunday’s 12 singles matches, however, it was a different story. The U.S. got the better of those, winning 28-20 to take a 7-1-1 edge in the series. Both teams sent out their big guns early. Reigning Scottish Open champion Trish Johnson was 5-under-par on the front nine en route to winning the day’s first match against Laurie Rinker, winner of the Legends Championship last month. Beth Daniel put the U.S. ahead with a win over Lorie Kane in Match 2 and the third – a much anticipated duel between Juli Inkster, in her first Legends competition at age 54, and England’s Laura Davies was an epic. Davies was 1-up before her tee shot went left at No. 9 and ended up a lost ball. She took a bogey to Inkster’s birdie, and Inkster never trailed again. She matched Johnson as the best player of the final day, touring Old Waverly Golf Club in 5-under par. Inkster was delighted with her visit to the Legends and may play another event before the year is out. That’s certain to happen, and Inkster said she might play in November’s 36-hole Walgreen’s Charities Championship in Florida if she doesn’t make the field for an LPGA stop in Japan. Inkster’s win over Davies gave the U.S. a 16-14 lead, and the groups playing behind them couldn’t keep pace. The U.S. seemed headed for victory at that point, though, leading in six of the remaining nine matches and standing all square in two others. The World team got within 19-17 after more matches were completed but Pat Bradley’s gutty double bogey on the last hole, which netted a point for a tied match with Alison Nicholas, kept the U.S. comfortably in front at 24-18. She didn’t, and Sherri Steinhauer clinched the Cup for the U.S. in the next match with a dramatic 30-foot putt on the last hole against Alicia Dibos. Steinhauer hadn’t played a competitive round since getting a bad break in August’s Legends Championship at French Lick, in Indiana. She shot a course record 63 in the second round at the challenging Pete Dye Course to get within striking distance of leader Rinker, but the final round was rained out and Rinker was declared the champion. Since that near miss Steinhauer suffered torn cartilage in her ribs and wasn’t sure if she could play at Old Waverly. The last two matches couldn’t affect the team outcome, and both Old Waverly owner George Bryan and Legends chief executive office Jane Blalock said they’d welcome a return to the beautiful Mississippi club.